The pig themed eco-bamboo 5 piece mealtime set is a colorful, durable and next generation kids safe dish set that promotes self-feeding habits, is easy to handle for small hands, helps contain mess and provides an environmental solution to plastic dishware. This sustainable kid dish set is specifically designed for children who are beginning to eat on their own. Bamboo is a safe and environmentally friendly solution for families looking for positive alternatives to caustic melamine/plastic kid plates. This set is made from 100% bamboo and retains all the strength and beauty of traditional plastic materials, but with the added benefits of eco-friendly bamboo construction. Our bowls, plates, cups and utensils are all biodegradable, so you can feed your children safely, consciously and with fun. 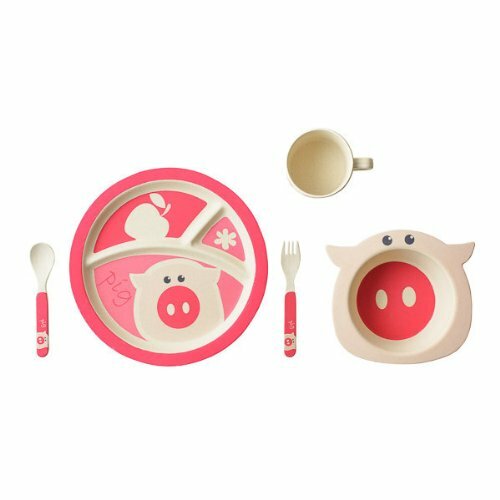 This pig themed bamboo kids dish set is colorful and stylish to keep you child engaged while eating, it's ergonomically designed with rounded and safe sides for easier scooping. These bamboo dishes are FDA approved food safe, dishwasher safe and constructed with reusable bamboo ware. No harsh chemicals or bleaches are used and free of toxic polymers. This bamboo kid dish set is a perfect solution to plastic and melamine kid dishes. This pig themed bamboo dish set includes: one large divided section plate, one bowl, one drinking cup, one spoon utensil, one fork utensil.